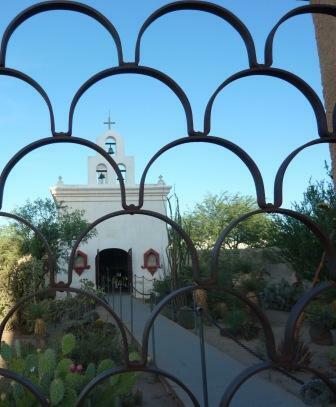 Yesterday's photo is one of the "classic" views of Mission San Xavier. Here is an interesting peek through a beautiful wrought iron gate at one of the side buildings. Photo courtesy of Damen Kompanowski. Did I tell you that one of the first places in Tucson that I remember visiting is the St Xavier Mission Church-in 1972! And only last March did I visit it again!